Rushed decisions are poor decisions. When it comes to home improvements, making a poor decision could mean that you spend thousands of dollars on a part of your house that you dislike but are forced to live with for years. And the kitchen is perhaps, most of all, one place that you don’t want rush when remodeling your Beaverton home. Think about it. You cook three meals a day there. If it’s a dine-in kitchen, you might eat three meals a day there too. Kitchens typically need to be the most well-designed room in the house—a place where you can get your food prep done easily and happily. You want a kitchen that is efficient, comfortable, and aesthetically pleasing. So if you’re in the market to remodel your kitchen, take it slow. We’ve put together a list of questions to ask yourself to make sure that you spend what you want and get a kitchen you can live happily with for years to come. What Do I Love About The Kitchen I Have? Take some time to create a list of things that are going well for your current kitchen. Most kitchens are laid out with a triangle formed between the oven, sink, and refrigerator. Is yours laid out like this, and if so, do you like it? Does it work for you? Think also about aspects of your kitchen like counter space, cabinet dimensions, and storage for kitchen tools and dry goods. If you notice that most of these things are working out quite well for you, your remodeling might just focus on improving the aesthetic appeal of the kitchen rather than the layout or efficiency. What Do I Love About Other People’s Kitchens? Beyond just your own kitchen, take inspiration from others that you just adore. An easy way to do this is to browse Pinterest and Instagram, which are teeming with gorgeous images of perfectly designed kitchens. An even better practice is to visit friends, family members, and acquaintances who have remodeled near Beaverton recently. Looking at pictures online is one thing, but nothing beats walking through a fresh kitchen to get inspired for your own. What Do I Hate About My Kitchen? If your current kitchen was all sunshines and rainbows, you wouldn’t be reading about remodeling it. Would you? You want your new kitchen to solve all the problems of your old one, so spending time identifying your pain points is perhaps the most important step in the process. One easy way to do this is to keep a running list of “kitchen hates” on your fridge. For one week, every time something about your kitchen annoys you, add it to the list. Notice all the little hassles you’ve grown accustomed to just putting up with over the years: bumping into someone or something, running out of storage, feeling crowded on the countertop, and so on. By keeping a tally of the things you want to avoid in your new kitchen, your Beaverton remodeling expert will be able to help you plan the kitchen of your dreams. What Do I Use My Kitchen For? Of course you use it for cooking, but think about it a little bit more. What are the day-to-day activities that go on in your kitchen? How do you use it on the weekends? Is it a hub of activity or is it the chef’s retreat? If you regularly host parties, you can design your kitchen in a way that encourages guests to socialize. For example, if you have the space for it, a large island summons people to gather, stand, have a drink, and mingle. Likewise, a wide-open entrance makes the kitchen more inviting, asking guests to enter and explore. A narrower entryway, on the other hand, gently communicates that the kitchen is not a gathering space. If you have kids, an open layout can benefit you in a variety of ways. For starters, it’s much easier to keep an eye on the little ones running around while you prep the food. A breakfast bar with stools could provide a place for quick meals before shuttling everyone off to sports and clubs—and it doubles as a place for kids to get some studying done or work on that big science project that’s due tomorrow. Remodeling in Beaverton on a Budget – What Am I Planning to Spend? And of course, one question you can’t neglect is budget. Don’t let your budget hold you back from designing a kitchen that you’ll love. But you also don’t want to plan things out so much without thinking about cost that you get your hopes up. According to Home Advisor, the average cost of a kitchen renovation in Beaverton was around $19,000. If your budget is lower or higher than that, you’ll still be able to find the kitchen that’s right for you. Setting the budget ahead of time helps you and your contractor create something wonderful without extending beyond your means. Ready to start your kitchen remodel? David Green Construction is ready to assign a master builder with over 40 years of experience to see your project through from start to finish. 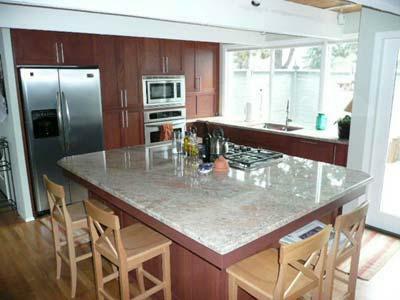 Call today to talk to an expert about your needs for kitchen remodeling in Beaverton.